Local residents have a new place to go fishing with the recent completion of the Poirier Lake docks in Otter Point’s William Simmons Memorial Community Park. The project involved installation of a boat launch dock and separate fishing dock. The boat launch dock is adjacent to a new parking area and trails providing access to Poirier Lake. The fishing dock is accessible via a new path connected to the park’s Panama Rail trail, about a 3-minute walk from either the boat launch parking lot or the Butler Road parking area, off Otter Point Road. The docks were installed as part of a Vancouver Island fishing infrastructure program, initiated by the Province of BC. The program was designed to encourage participation in angling through increased accessibility to fishing spots near urban centres. “The key to developing the next generation of anglers is to get young kids and families involved at an early age. Poirier Lake is stocked with a good density of catchable rainbow trout,” stated Ministry of Forests, Lands and Natural Resource Operations, Minister Steve Thomson. 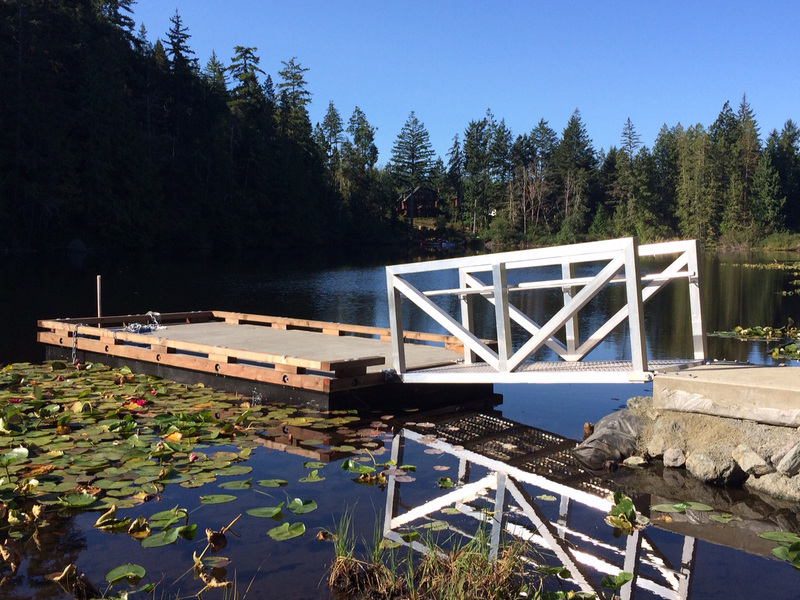 “The new dock will provide kids with a great opportunity to catch a fish, hopefully getting them hooked on the sport for the rest of their lives.” The lake is stocked by the Freshwater Fisheries Society of BC, who also administer the infrastructure project. “The Freshwater Fisheries Society of BC is working with partners around the province to improve access to fishing,” said Adrian Clarke, Vice President of Science. “By funding docks, such as this one, we’re helping to make it convenient and easy for local residents to fish, especially if they only have a few hours.” Funding for the docks came primarily from the Habitat Conservation Trust Foundation (HCTF), an environmental granting organization that views angling as a way of getting people connected to the outdoors. “People care most about the things they know,” says Brian Springinotic, HCTF CEO. “One of the ways people can connect with their local environment is to head out to a natural setting with their families and fish.” The Juan de Fuca Parks and Recreation department utilized program and UBCM Gas Tax funding for associated construction costs and materials to the Poirier dock project. The addition of the docks, trails and new parking and picnic areas was part of the park’s long term plan to enhance recreational opportunities on Poirier Lake. 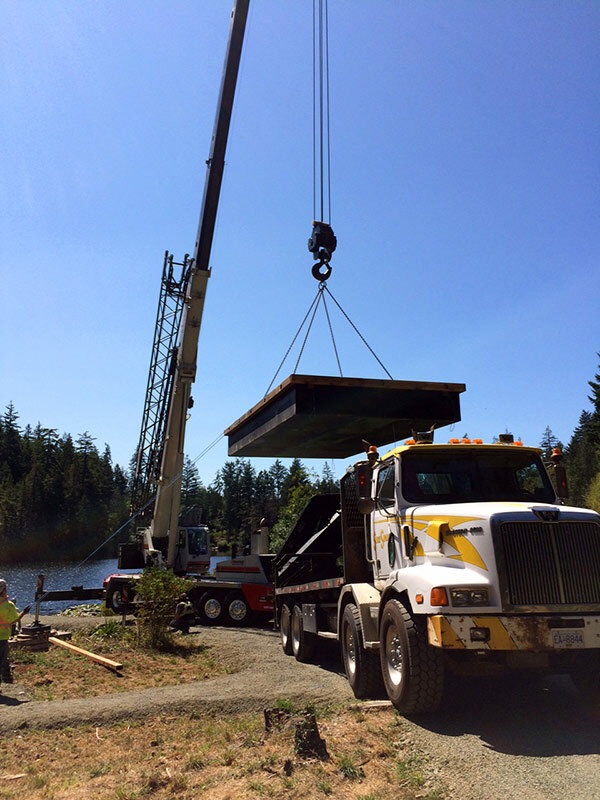 “The ability for local residents to fish and recreate on Poirier Lake was welcomed by the community as a great addition to this local park” says Juan de Fuca Regional Director Mike Hicks.